HOUSTON —Mother Nature, we need your help. After one day of delay due to bad weather, a college team of engineering students is hoping for better luck today (July 19) in order to fly on an acrobatic airplane ride and experiment with fire in zero gravity. 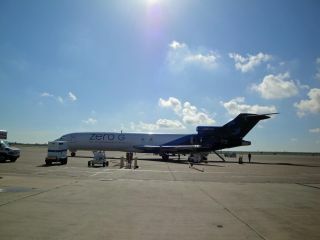 The eight-student team from the University of California, San Diego is one of seven university teams set to fly a variety of experiments on a Zero Gravity Corporation jet from Ellington Field here today as part of NASA's Microgravity University Program, which provides students with access to weightless conditions for their experiments. The UCSD Microgravity Team is led by aerospace engineering senior Sam Avery and SPACE.com has been following the group's work as its team journalist to provide a glimpse into how student science on weightless flights is performed. Editor's note: You can follow the progress of today's NASA Microgravity University Program flight via the program's Twitter feed @NASA_RGEFPand by following the hashtag #DefyGravity. UCSD Microgravity Team member Nico Montoya has been posting updates about the team's work at @NicoSuave9. Email Tariq Malik at tmalik@space.com or follow him @tariqjmalikand Google+. Follow us @Spacedotcom, Facebook and Google+.